WireGuys has the ability and expertise to help you with the design and installation of your structured and premise cabling requirements. The foundation of all information networks and modern communication is structured cabling. Wire Guys are industry leaders in the design as well as the deployment of cabling systems that are structured, guaranteeing installation that is cost-effective as well as the ability to upgrade and extend your system to any technological changes which may come in the future. To perform daily operations without a glitch, your business relies on a network that is efficient and reliable. What’s more, how effective your system depends on the quality of the wiring and cabling that your network´s foundation is made from. The professional, structured wiring and cabling services that WireGuys provides can enhance your infrastructure’s capabilities to deliver exceptional manageability, performance, scalability, and reliability. You can rest assured that with structured wiring you have phone and data cabling which is consistent, scalable, and safe. Our experience and knowledge allow for all of your systems to be operated – communications, access, lighting, security, wireless – via a single network, lowering manpower and costs. With a single network, we can run multiple systems, decreasing the costs for design, installation, and operation. We have completed many data center structured cabling design and installation projects. We create a path to the future that is clear, thereby providing one point for all management and administrative requirements making identifying and expanding the network for any future requirements easy. Since 2007, Wire Guys has been offering our structured cabling services in Toronto and Greater Toronto Area, and we have provided services to businesses in a variety of sectors. Offering your business the necessary growth that you are looking for is our main goal, all the while maintaining real attention to detail as well as the ultimate convenience. As technologies converge, we as consistently evolving and offering structured cabling systems that are complex to support every multi-faceted communication system designed to not only meet but also exceed the current and future requirements of our clients. At WireGuys we offer Structured Cabling as well as Point to Point cabling services in the Toronto area. There are also several cabling value-added services that we offer, for example, network surveys and installation audits, Cabling design assistance, as well as other programs that could benefit your company. We are committed to providing small, medium and large operations with integrated low voltage solutions for increasing productivity, maximize service differentiation, sustain growth, and minimize risk in today’s challenging technological environment. 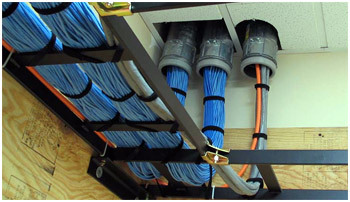 Structured cabling leads to a reliable, agile system that performs to the best of its ability. The WireGuys team brings your cabling structure into the new age with an infrastructure that is easier to manage and performs undeniably well. Plus, you can enjoy easier scalability down the road.